Logitech has today announced two new music game controllers designed for use with music games on the Nintendo Wii. The Wireless Guitar Controller for Wii is constructed with a maple neck, rosewood fingerboard and metal frets, so it both looks and feels more authentic. It features a noise-dampening design and fret buttons, plus a touch-sensitive slider on the fret board. 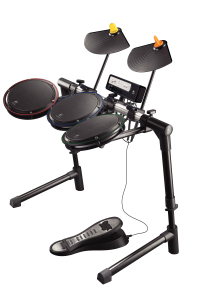 Alongside this is the Wireless Drum Controller for Wii, featuring three fully adjustable drum pads and two cymbal pads. The kick pedal has a stainless steel surface and adjustable spring, while the recessed rim design avoids accidental rim shots. Fully licensed and compatible with the Wii, the Wii Remote snaps into the controllers, with each product featuring an analog stick for navigating menus. Available next month for $199.99 (guitar) and $229.99 (drums) in the US and Europe.